Vera-Playa Penthouse, compared to 'playazo' services and luxurious amenities, 2 bedrooms, 2 baths, living room, kitchen and utility room, in front of the mall, water park, restaurants, ATMs and service area. 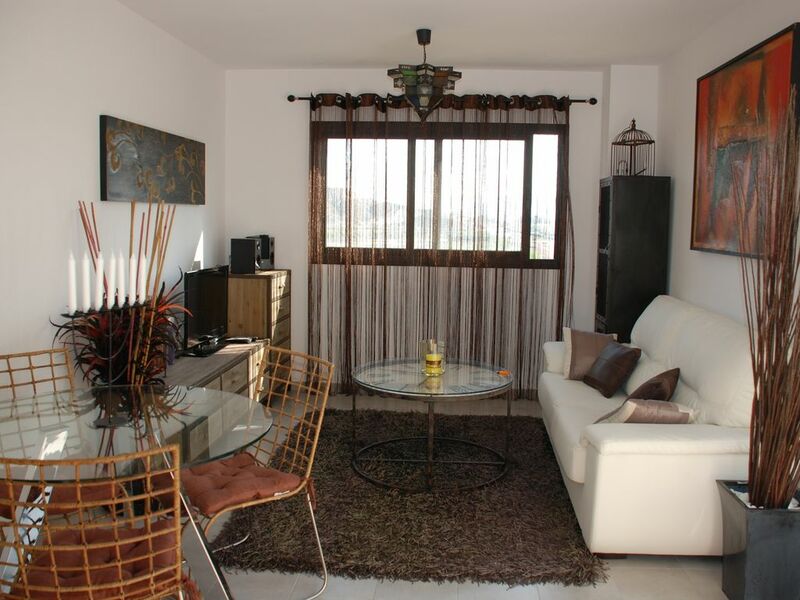 180 meters apartment, terrace and solarium. Air conditioning, refrigerator, dishwasher, microwave, coffee capsules, toaster, sandwich maker, vacuum cleaner, LED TV, HiFi, satellite TV, terrace and solarium area with 102 meters outdoor dining, chill-out zone, hammocks, umbrellas, gazebo-gazebo, telescope, gas grill, this orientation, the complex has a playground, garden, swimming pool with lawn and parking. L'appartement était très propre et superbement meublé. Extrêmement fonctionnel, il possède 2 terrasses bien aménagées et fleuries. Il est bien situé quoique un peu trop près d'une route et face au parc d'attractions d'eau, un peu bruyant en journée. Cependant, nous y avons passé un excellent séjour, les activités sont proches et la voiture peut rester garée. Jesús, le propriétaire, est très accommodant et disponible. Excellent choix de location, je recommande. Très bel appartement, bien situé, bien équipé. Idéal pour une famille de 4 personnes. Nestled against the leisure area of ​​Vera Playa, less than 100m from magnificent water park and 200 meters from the mall, surrounding restaurants, Bars and area services. Within a radius of 10 km 4 golf courses and 1 internship: Valle del Este, Desert Springs, Macenas Beach Golf Club, Marina Golf Mojacar. Rental of sailboats, yachts and shore excursions in Garrucha. Aquatic and underwater activities nearby: Sailing, windsurfing, kite surfing, Canoe on waves, etc. Equestrian Club in Vera: horse riding, horse shows, rent Quads, Buggies, Motorcycles, mountain bikes or walk. Kart track nearby. Club Tennis and paddle with the possibility of classes. Physiotherapy, Wellness Thalassotherapy, spa and beauty treatments at Club Puerto Rey. Gliding Club in Vera, Olympic Shooting Club in Vera: Plato, Precision. Hiking, thematic routes and Aventura. Paintball area with trenches, bunkers, tires, trees and wooden houses. Other Activities: Nature tourism, gliding, karting, Olympic shooting, hiking, etc. Golf: 4 Golf Courses in its surroundings (within 10 kilometers) and a driving range. Valle del Este Golf Club, Desert Springs Golf Club, Playa Macenas Golf Club, Marina Golf Mojacar, driving in Puerto Rey. 25% en concepto de reserva con 15 días de antelación al menos. 150 euros en concepto de fianza a devolver tras la recepción de las llaves y una vez comprobada la ausencia de desperfectos.